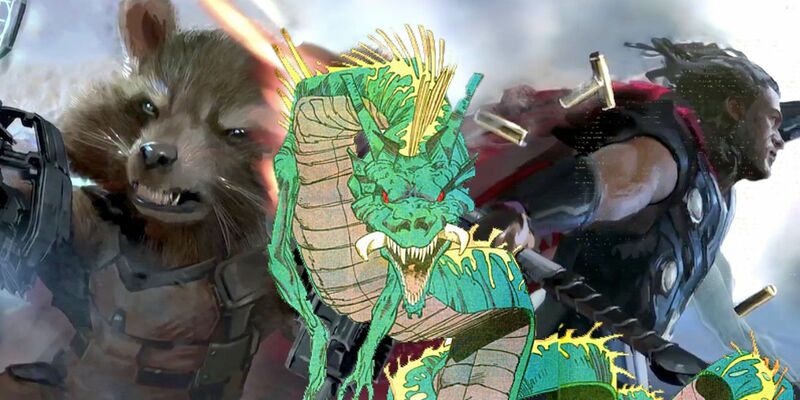 Avengers: Infinity War concept art reveals Thor and Rocket in battle against what may be a Hydra – or, more likely, is the MCU’s equivalent of the Midgard Serpent. It’s a major hint that themes of Ragnarok, or The Twilight of the Gods, continued beyond the events of Taika Waititi’s Thor: Ragnarok movie. Promotion for Avengers: Infinity War began in February 2017, when Marvel Studios released a “Day One” video that included tantalizing concept art of the film’s heroes. One particularly exciting scene showed Thor and Rocket side-by-side, teasing a promising team-up between the God of Thunder and one of the Guardians of the Galaxy. It also sparked theories that Thor would gain a new weapon, with most fans initially (incorrectly) guessing it would be the enchanted Jarnbjorn. And now, more info has been revealed about that particular concept art. The Art of Avengers: Infinity War includes a two-page spread featuring that same image – but reveals that, until now, Marvel only released part of it. The full picture saw Thor and Rocket battling a serpentine creature that’s similar to a Hydra in Greek mythology. Given the Norse themes of the Thor franchise, though, it’s more likely the MCU version of the Midgard Serpent. In Norse mythology, the Midgard Serpent – also named Jormungand – is intimately tied to the legend of Ragnarok. It’s envisioned as a serpent so large that it encircles the globe, and, when it rises from the deep, it will be one of the climatic events that brings about the end of everything. What’s more, the creature’s arch-enemy is Thor. Naturally, this is a myth the Thor comics have delighted in exploiting on many occasions. No context is provided for this image, however, but it’s presumably connected to an alternate quest for Thor’s Stormbreaker. Marvel always intended to send Thor on a side-quest to acquire Stormbreaker, but the nature of the mission seems to have changed significantly. In some versions, Thor headed on a quest to find Stormbreaker rather than forge it; that’s probably the case here, with the God of Thunder retrieving the weapon and battling Jormungand in order to escape Nidavellir. The fundamental problem, though, seems to have been that this just felt disconnected from the main story. As Stephen McFeely reflected in The Art of Avengers: Infinity War, “[This scene must] provide a test for Thor, but it also shows what Thanos has wrought.” Evidently the Midgard Serpent just couldn’t be tied to Thanos, thus making the plot irrelevant to the main narrative. Instead, Marvel chose to go for a version of the script in which the Dwarves had suffered at Thanos’ hands. Interestingly enough, even when Marvel settled on that plot point, the studio still wasn’t quite sure about how to make Nidavellir work. The art book shows a wide range of different designs for the Dwarven planet, proving that Marvel experimented with a lot of different ideas.